disk0s4 is the partition with the windows on It. But when trying to type the first line, I received an error saying "Resource is busy". My software is MacOS High Sierra. If there is any help, I would be grateful. Below is the output from diskutil info disk0s4. Use Hard Disk Manager to repair and partition BOOTCAMP. Not the answer you're looking for? 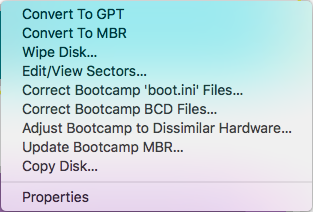 Browse other questions tagged macos disk-utility partition .